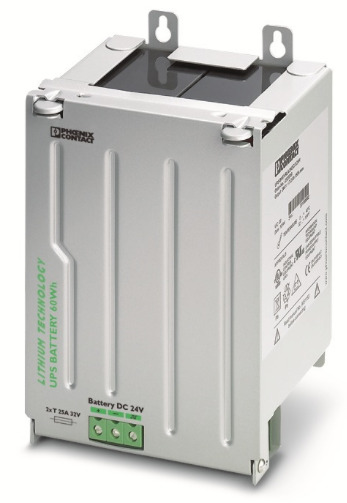 A lithium-ion-based battery is now available for Phoenix Contact’s Quint UPS-IQ line. MIDDLETOWN, Pa. – A lithium-ion-based battery is now available for Phoenix Contact’s Quint UPS-IQ line. The new battery’s longer lifespan and extended temperature range minimize the need for frequent battery replacement. The lithium technology has a lifespan of up to 15 years, depending on the ambient conditions. That is nearly three times the lifespan of the standard valve-regulated lead-acid (VRLA) battery. The new battery can operate between temperatures of -20 to 58 Celsius, compared with the zero to 40-degree range of the VRLA battery. This wide temperature range allows back-up batteries to be placed in harsh environments. The li-ion battery is designed for use with both the AC and DC versions of the Quint UPS-IQ. The Quint UPS-IQ is an intelligent industrial UPS that gives the user advanced diagnostics and battery management information, including the states of charge, health and function.